This review is of an A5 Appunto which I have recently received to review and try out. 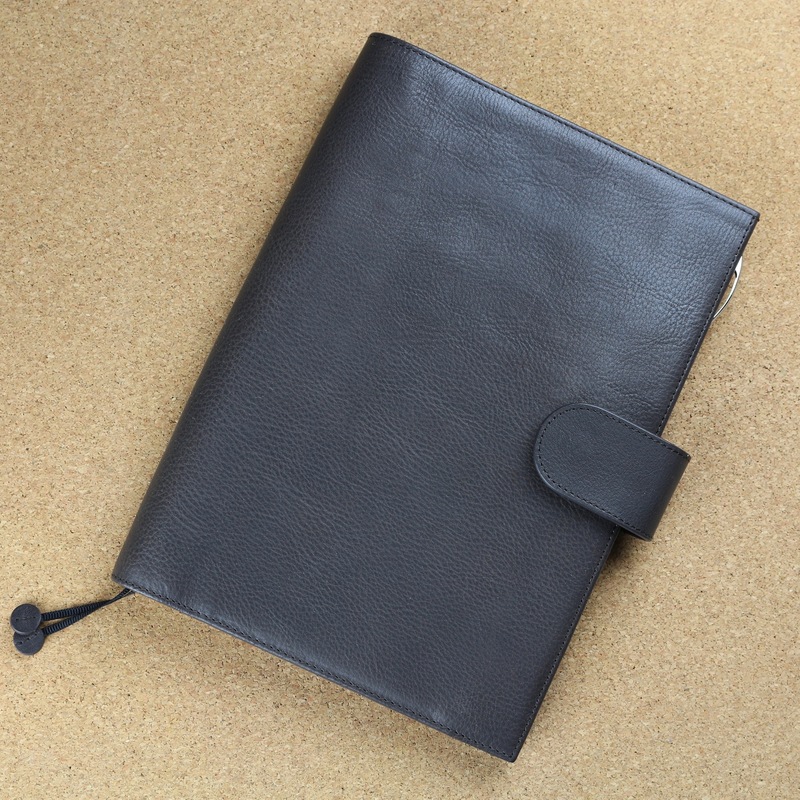 The review sample is also in a new leather colour ‘Anthracite’ which is a lovely dark grey colour. It isn’t as stark as pure black, but not too light a grey colour either. The Appunto is in Italian vegetable tanned leather, there is no stiffener between the layers, so it is soft and supple to the touch. With the A5 Appunto open you can see that there are plenty of pockets and slots for most peoples requirements. 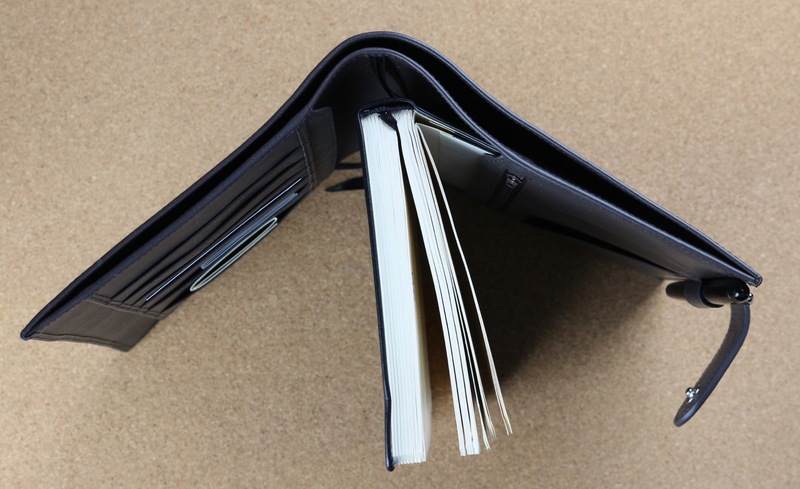 The inside front cover has 4 regular card slots and two deeper card/note card slots. There is a full height slip pocket on the outer edge as well. 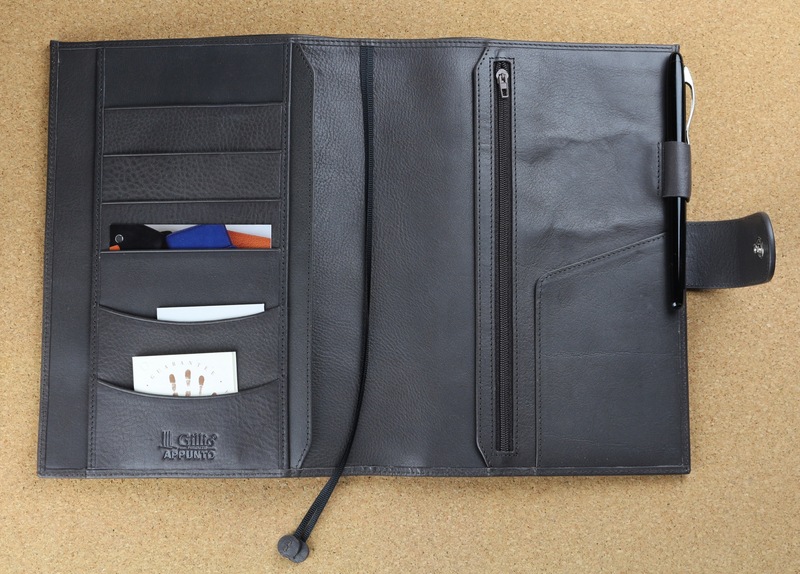 On the back inside cover there is a full height zip pocket and a half height secretarial flap pocket. The elasticated pen loop sits above the broad clasp. There are two book marks in the central section. 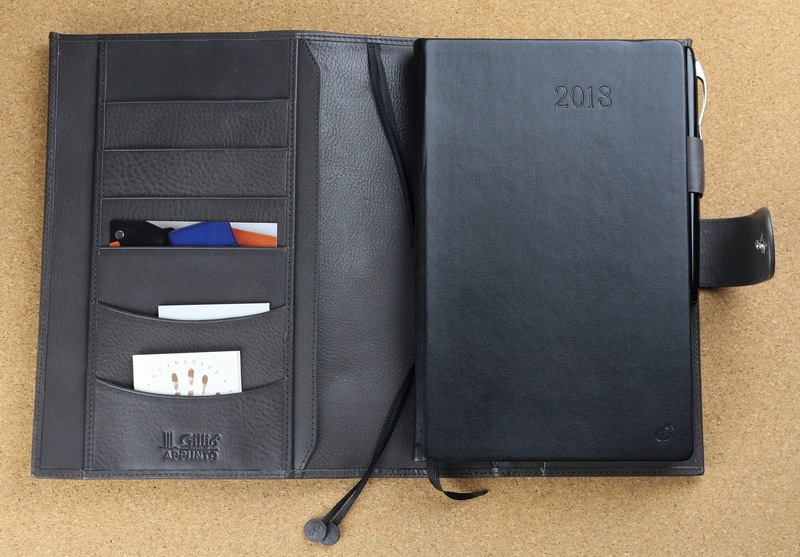 There are slots on both the front and back inside cover to hold your planner/notebook. I intend to use the Appunto with my Quo Vadis Daily 21 planner, which I use as my daily journal. I’ve been using this make/model/size as my journal since 2013. The paper is excellent and it takes fountain pen easily. The Daily 21 being A5 size, slots in neatly in to the A5 Appunto. 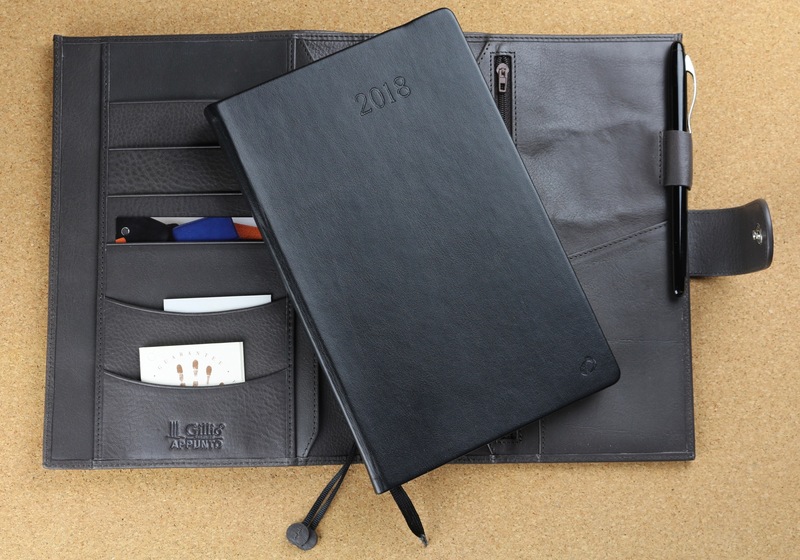 The Daily 21 has stiff covers, so I only slotted the back cover in to the Appunto, but for soft cover planners/notebooks you can slot both the front and back covers in to the Appunto, it has provision for this. The A5 Appunto also has a full width back cover, so you can also carry loose A4 size pages as well. I scanned in the new leather and an existing Gillio Compagna in Royal Blue, so you can see the difference in the leather colour. Grey is often a difficult colour to photograph, so scanning it in often produces a more accurate result. You can see the other Gillio leather colours in a previous post on Philofaxy. The A5 Appunto measures when closed measures 230mm high by 170mm wide including the clasp. Thank you to Gillio Firenze for the A5 Appunto review sample in Anthracite.